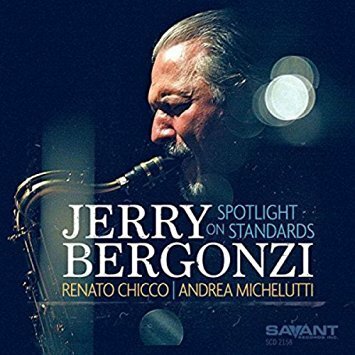 The Boston based tenor magician Jerry Bergonzi returns to the organ/tenor/drums format to spin his harmonic sorcery on his latest offering titled Spotlight on Standards. The saxophonist/educator known as the Gonz, while lauded by the insular community of his peers, is not a household name among the general public. He is known for his muscular, hard edged sound, his exquisite fiery technique and his boundless creativity. Jerry Bergonzi grew up in Boston and started on clarinet at age eight. He credits a musical uncle who used to live upstairs from him with turning him onto jazz early. In youth bands he learned from two of the best instructors, John Laporta and Joe Viola and eventually studied music education at University of Mass in Lowell, MA. Bergonzi spent several years in New York developing his sound, jamming and shedding with other notable musicians of his era before getting a call from pianist Dave Brubeck. With Brubeck, Bergonzi traveled and played some of the largest and most prestigious festivals and venues in the world. It was a liberating experience and a steady paycheck. The first recording on his discography is from 1973 on Brubeck's Two Generations of Brubeck. The now sixty-eight-year-old Bergonzi was the saxophonist with Brubeck's Quartet from 1973-1975 and then again from 1979 to 1982. By the early eighties Bergonzi was back in Boston and began his teaching career, first with private instruction, then publishing books on improvisation and eventually becoming a full time professor at The New England Conservatory of Music where he teaches to this day. Over the years Bergonzi has written upward of one hundred songs and played as a leader or sideman on over thirty records. On his latest, Spotlight on Standards, Bergonzi is joined by organist Renato Chicco and drummer Andrea Michelutti. This organ trio format is one the saxophonist last used with organist Dan Wall and drummer Adam Nussbaum back in 1999. From the opening lines of the Cy Coleman classic "Witchcraft" you can hear Bergonzi's muscular tenor is not about to play this or anything else straight up. It is his resolute willingness to re-harmonize the theme in his own unique way that makes the music so much more than a re-hash of an old standard. This is a re-imagining of the song where the melody is a mere armature upon which to reconstruct something fresh and new. Coupled with his signature saxophone sound the song takes on a new life. The next four tunes are all Bergonzi originals. His distinctive technique uses creative articulation, a fluidity of thoughts and innovative dynamics to achieve that most precious of commodities- originality. Listen to the elastic logic of his saxophone on his composition "Bi-Polar." The notes gush like a wellspring of exploratory thought from a savant's mind. On "Blue Cube" he creates a memorable repeating motif. Chicco and Michelutti sustain the easy shuffle over which Bergonzi offers a series of deliberate, sometimes searing lines. He often takes no easily readable path, but nonetheless he lead you to his intended destination. Chicco's B3 soloing is subtly but equally probing. "First Lady" is an interesting composition with an uplifting, almost Bossa feel. Bergonzi's use of the lower register of his instrument never fails to swing. He drifts over the changes with an airy lightness and solid conviction. Michelutti is a master of interjecting timely accents while maintaining a rock-steady rhythm. Bergonzi's mournful "Gabriella" is perhaps his most sensitive ballad on this album. The plaintive tenor sound is quite compelling throughout, offering a window into the deepest recesses of the artist's soul. It is a wistful cry that cannot be ignored. Chicco's deft church-like organ brings a pious, religious quality to the whole proceeding. Bergonzi's command of his instrument, using it as an extension of the human voice, is extraordinary. The program returns to the American Songbook with "Dancing in the Dark," and "Out of Nowhere." At all times the group displays a solid swing and a masterful ability to create surprising iterations of the melody. On Johnny Mercer's "Come Rain or Come Shine" we find Bergonzi's at his best. His punchy sound articulates with authority as the rhythm section grooves along. He seems to draw from an inexhaustible well of ideas that never seem to repeat and never fail to surprise. Ned Washington and Victor Young's venerable standard "Stella by Starlight" is treated with authority and conviction when Bergonzi and company re-imagine this classic. The solid swing, the aggressive declaration of Bergonzi's saxophone with his rapid fire lines and Chicco's unusual B3 musings that seem to directly descend from Larry Young, make this one special. It's almost an entirely new song. Bergonzi's solo is overflowing, bursting with ideas, Chicco's playing is stellar and Michelutti is so subtly correct as to be transcendent.